Tiffany and I set out today for another great adventure and what a day we had! With some really great scouting by Tiffany and a whole lot of luck, we were able to not only find Frontier’s Band, but actually got all the way out to them in some pretty challenging terrain. Tiffany wanted to check on Smokie’s new Filly and I hadn’t yet seen her so how exciting for us to find them in a needle in a hay stack! What we weren’t expecting was to find another brand new baby that we weren’t even thinking of. As we came around the final corner to where they were, we couldn’t see Mare Lacey. 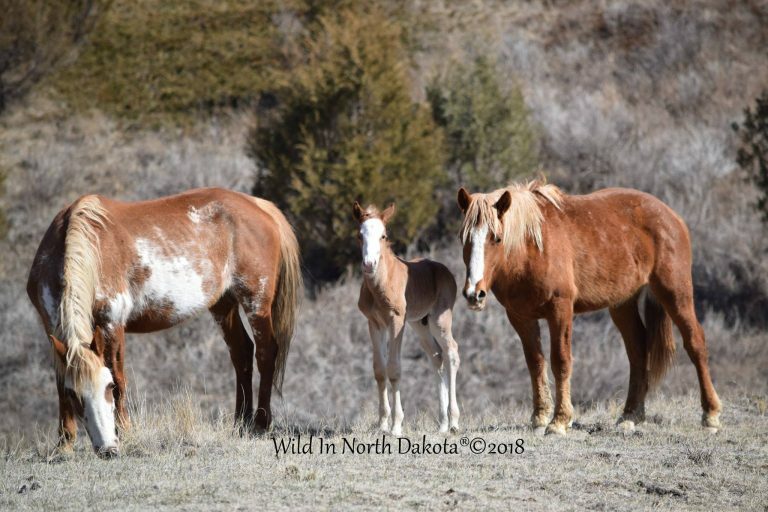 As we got closer, we saw her down below and lone and behold, there was her brand new 2018 Colt! What a beauty he is and what a treasure to unexpectedly stumble upon him! He is flanked by his Dam Lacey on the left and his 2016 brother Volt on the right in the photo. Each of these encounters are true blessings that we cherish and never take for granted. He very much resembles his big brother Wind Dancer and is just as sweet as can be! We spent a great afternoon with the Band and took lots of great pictures that I’ll share in the days and weeks to come. So enjoy this surprise bundle of joy and be sure to share him far and wide to welcome him into this incredible herd! Thanks everyone!